Pay-per-click (PPC) is a highly effective form of digital marketing. It reaches targeted audiences; it has not-to-exceed budgeting; and it only incurs costs upon a click, which means it has done its job. Paid search and social dominate as mobile PPC channels. Now, however, Phy brings mobile PPC marketing to the Physical channel with a creative new approach that captures the high-intent audience of search, while also broadening and qualifying the audience like social. In the Physical channel, people engage directly through touchpoints like QR codes on products, in print, or near services. Historically, these interactions have blindly connected to single links, but Phy replaces blind links with a new user experience -- the ability to preview and choose from a list of multiple actions that have been curated by the marketer for relevance. The choices can include useful promotional materials, payment tools and connections to customer support; all presented together for customer selection. A page of previewed links, presented in the format of search results, is instantly familiar to users and is an effective alternative to a custom webpage. It delivers greater utility by enabling users to quickly select the link that serves their need. It’s more flexible due to its modularity and ease of updates. Also, it’s faster to implement because previews can be created automatically from existing metadata, much in the same manner as search ads. Selectable previews transform touchpoints, such as QR codes or NFC tags, into a PPC service that incurs costs only after a user reviews and selects a marketer’s content. 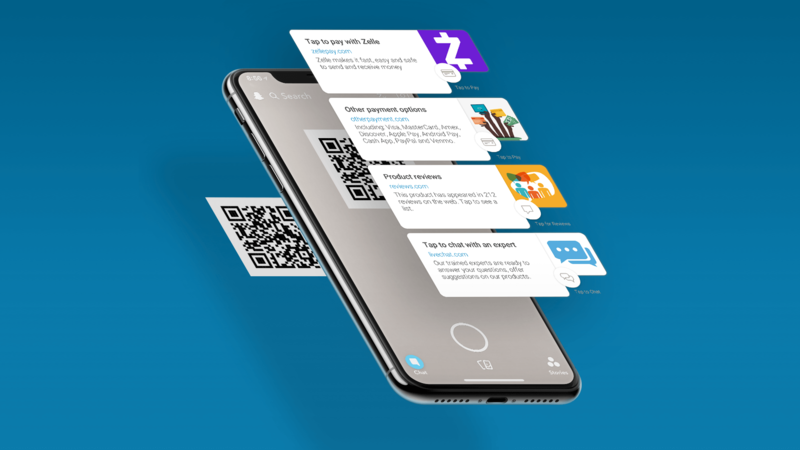 For QR codes, this enables powerful metrics that for the first time measure user intent, as well as the relative value of content for products at hand. 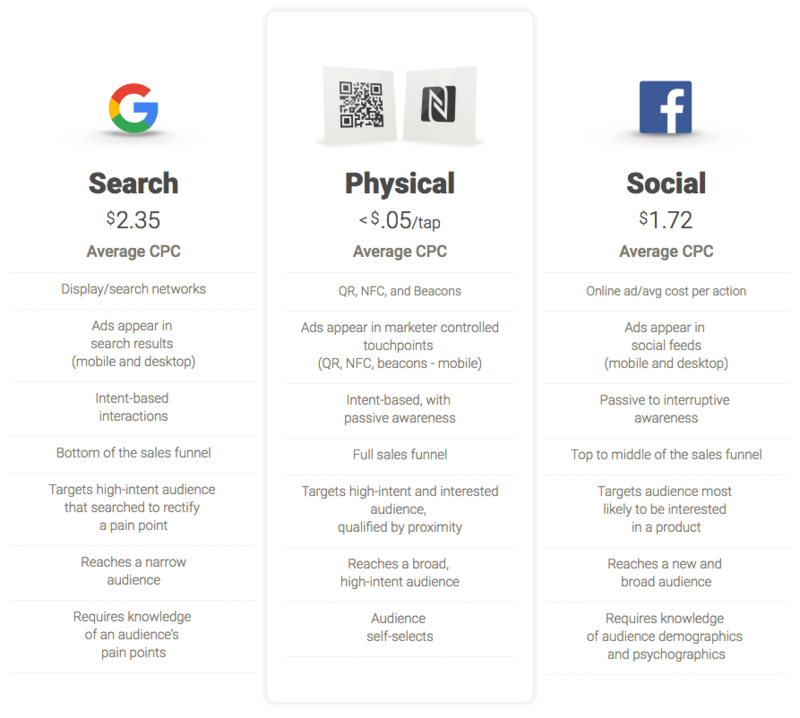 Physical channel marketing incorporates the best attributes of search and social, and it produces clicks that are every bit as valuable as those from either. By reaching customers at the point of intent, purchase, or interaction, the Physical channel captures the high-intent, specific-need audience of search while simultaneously qualifying and reaching a broader audience like social. Importantly, actively managing the Physical channel allows brands to engage and create positive customer experience when they matter the most. produces a clear understanding of what information your customers value because they tell you. Having multiple previews ensures that people are choosing the content that is meaningful to them, which also makes the customer experience interactive. No longer do you need A/B testing, when you can offer A, B, C, and D simultaneously and find out instantly which resonates. One link is never enough to serve a diverse customer base. Offering a choice better meets your customer’s needs while giving you deeper insight into their motivations. Sometimes they’re ready for an immediate purchase, sometimes they want more information, and at other times they need help. Multi-action touchpoints serve all three audiences, thus simultaneously driving awareness, loyalty, and sales. In fact, it’s the ability to supply additional useful actions that are clearly superior to search or social. Search is there to answer a user’s next question, but not to keep them on a brand’s chosen path. All of these supporting links can be added or updated with ease, are measured for usage, and are implemented without the complexity of designing a new landing page. Multi-action QR codes are the first QR codes that users will find useful the majority of the time. With the resurgence of QR brought on by support from the Apple camera as well as most social apps, isn’t it time that you try an effective new version of QR? With new multi-action functionality, free scans and PPC pricing, you have nothing to lose except additional customer engagements.